There are only two moving parts - the fan and the pump. Most likely the fan pooped out. The combustion side lives in a harsh environment. I got it working by cleaning up all the electrical contacts. I had been working on the contacts in the fuse area and got inspired to give that a shot. So it worked great for a few days. Then yesterday while driving it made a squeaking noise a couple times. They were very brief the first two times, and I actually thought it was the speedometer getting cranky. But the third time it made the noise, I was at a stop light and quickly realized that was the heater. Before I could turn it off, though, it quit altogether. No fan run on or anything. I haven't had a chance to check the safety fuse or the "breaker" or any of that on the heater yet. Just wondering though, what the noise may have been and where to start. While I was at the light, I did briefly reach in and see if the air fan moved and it does still spin. Ive had a space dedicated to the Eberspacher made up. All types of Eberspachers welcome! Yes its entirely possible to do. Weather you do it piece by piece or most all at once it for sure can be done. Last year - and this is not a common thing but two complete units poped up in the box NOS condition. These will fetch in the $500 to even $1000 foe the ambitious. Those listed pics will also aid you in seeing the complete unit and parts - less the cabin ducts. It may take some diligence but all the stuff is out there. Look for parted Thighs with gas heaters, Ask the seller to pull everything for it. There are also plenty of "fixit" info here and you tube so you can restore one or three. I myself have lots of vids and an ongoing thread over in the Bay forum. 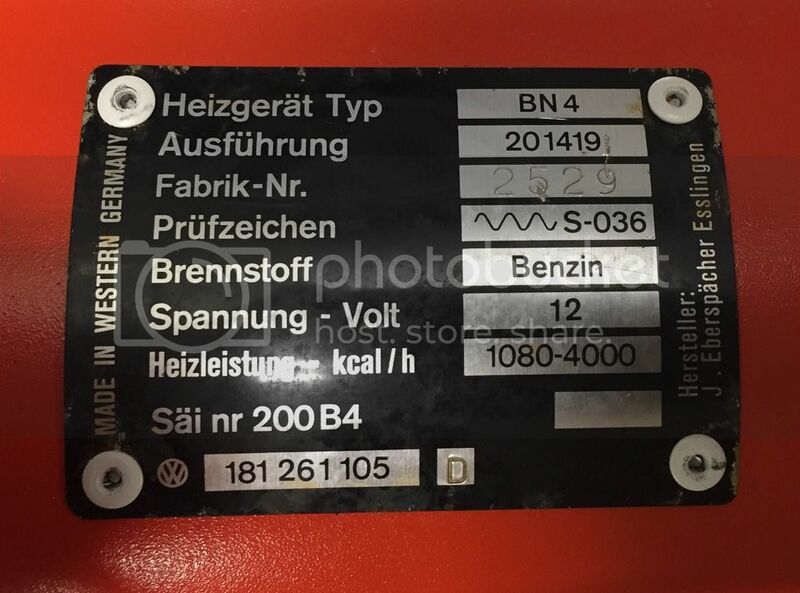 I have a 73 Vw Thing, and when I purchased it all the heater parts have been removed. I tried contacting the previous owner to see why all the heater stuff had been removed. How hard and expensive will it be to locate and reinstall everything? I know it's a very general question but it a possible thing to do without getting screwed? The Safety Switch is an important safety component. There is a small heating element in the safety switch. When you turn on a cold heater, that heating element begins to heat up. 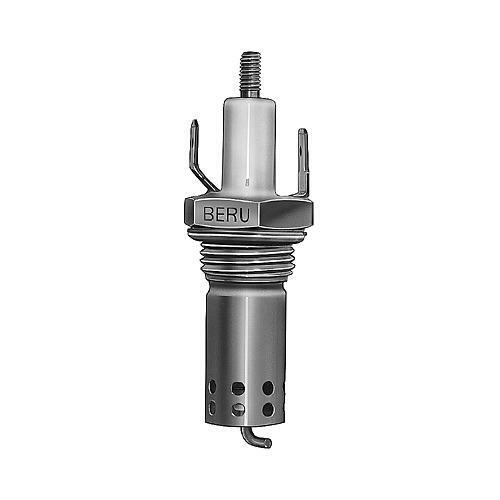 If for any one of a number of reasons the BN4 doesn't fire and begin to produce heat, after a predetermined time the heater in the safety switch will heat up a bi-metal piece inside the safety switch which will deform and trip the switch, thereby shutting the BN4 heater off. This is to prevent a dangerous buildup of unburned fuel in the BN4. So, while it is possible to bypass the safety switch, it's not advisable. so... Is there any "safe" way to bypass the "saftey switch", one of my little paper looking fuse type connectors on the top end of the saftey switch is busted, can it be replaced? if so with what? I would get a new safety switch. But its basically a circuit breaker for the most part. If you bypass and something else is at fault - I could only imagine a wire heating and burning ruining your loom. If everything is fine - it will run fine. Please note that my heater does not have a temperature control sensor at the exit of the heater. Yeah. It has an unusual safety switch there too. Possibly some home brew happening there. You can find the wiring diagrams for the BN-4 in the Technical Section under Thing Wiring. Click here and scroll down. While you're there you might want to have a look at the BN-4 Ladder Diagram. You should be very wary of operating a gas heater with substituted or missing components. The safe use of the heater depends on the ability of the components to interact with one another. 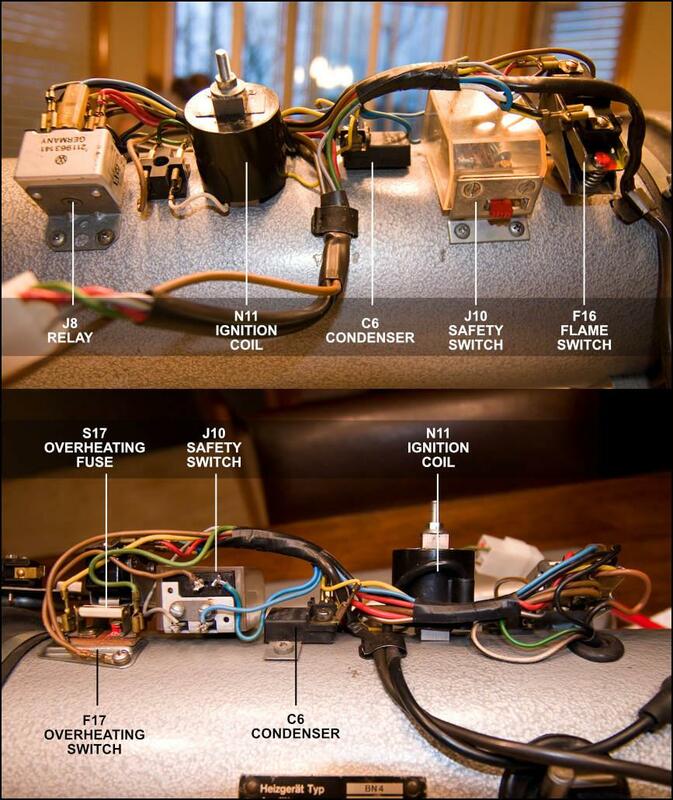 Here's a photo of the top of the heater with the components labeled as per the wiring diagram. Anyone have any temp control knobs they want to sell? The one on the left for the cable - hooked to the thermostat says TEMP on it? I posted most info to the bay BN4 thread I've been running up. Just thought some of you would find some of the last postings of interest. 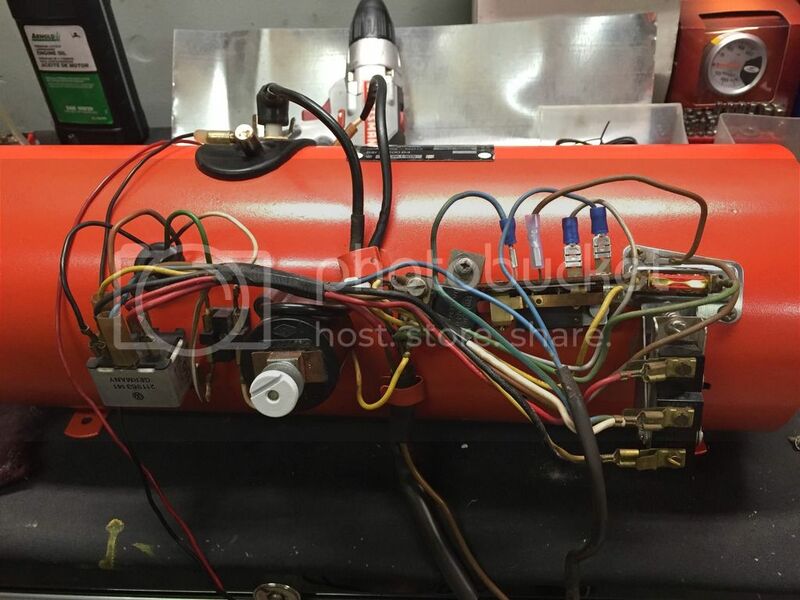 I am rebuilding a Eberspacher BN4 gas heater but I'm having a problem trouble shooting some wiring issues. I have taken a picture of the data plate on the heater and a shot of the wiring and attached to this email for your reference. I was wondering if you hade a copy of the correct wiring digram for my heater? Please note that my heater does not have a temperature control sensor at the exit of the heater. I'll be downloading a number of his videos. I think I am losing it! I could have sworn I read a stretch in here regarding a guy who rebuilds the timer switches in the dash. Is there such a person or service? Mine needs it....bad! Hey guys! Mike here, new to the thing/181 forum but making my grand entrance to call upon your gas heater expertise. I have a Baywindow, with a bn4. My heater doesn't work. I had considered trying to fix it, but found a guy here on TS that has great pricing on restored units. Next comes to, while I have one currently installed does anyone here have instructions perhaps from when these things were new on how to PROPERLY install the heater? Of course I'm very fearful of fire, and have no idea how these things work or hook into the bus. I will be learning, once I have all my pieces gathered in a couple weeks. But would like something to look back upon so I can be comfortable I've installed it the way it was intended. Stacey in Canada sells a reprint of the BN4 heater manual. A WISE investment for sure. Search the classifieds for "eberspacher"
That is a totally stock factory mount with the 1/2 inch felt glued to the bottom. I have had it off road and the tire never moves around.